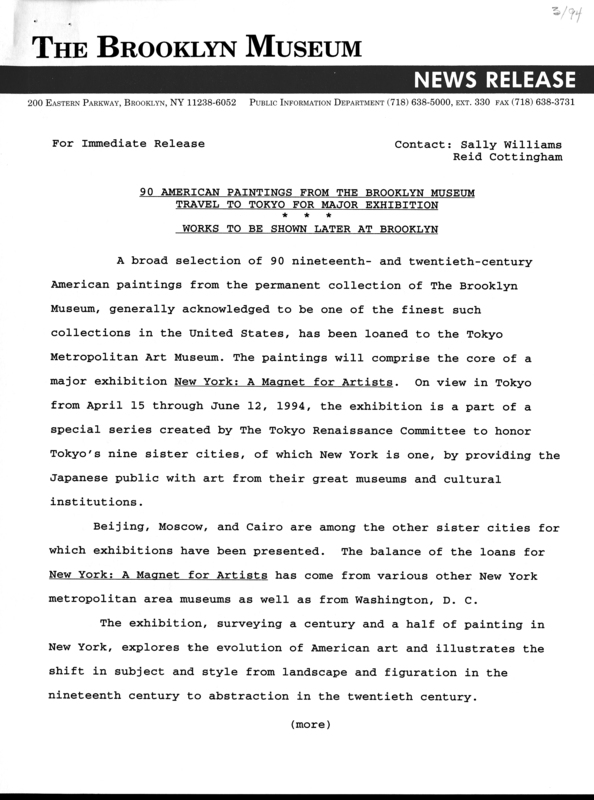 August 17, 1993 A broad selection of 90 nineteenth- and twentieth-century American paintings from the permanent collection of The Brooklyn Museum, generally acknowledged to be one of the finest such collections in the United States, has been loaned to the Tokyo Metropolitan Art Museum. The paintings will comprise the core of a major exhibition New York: A Magnet for Artists. On view in Tokyo from April 15 through June 12, 1994, the exhibition is a part of a special series created by The Tokyo Renaissance Committee to honor Tokyo’s nine sister cities, of which New York is one, by providing the Japanese public with art from their great museums and cultural institutions. Beijing, Moscow, and Cairo are among the other sister cities for which exhibitions have been presented. The balance of the loans for New York: A Magnet for Artists has come from various other New York metropolitan area museums as well as from Washington, D. C.
The exhibition, surveying a century and a half of painting in New York, explores the evolution of American art and illustrates the shift in subject and style from landscape and figuration in the nineteenth century to abstraction in the twentieth century. A portion of the ninety Brooklyn paintings included in the exhibition in Tokyo, many of which have not recently been on public view, will comprise an installation at The Brooklyn Museum in the fall of 1994. Titled Grand Reserves: Selections of Nineteenth and Twentieth Century Art from The Brooklyn Museum Collection, it will be on view November 18, 1994 through January 7, 1995. Among the paintings from The Brooklyn Museum’s permanent collection that will be on view in both Tokyo and Brooklyn are Milton Avery’s Sunset; Pennsylvania Station Excavation by George Bellows; Mount Baker, Washington, from the Frazier River, by Albert Bierstadt; several works each by William Merritt Chase, Albert Pinkham Ryder, and Frank Stella; Frederic Edwin Church’s Tropical Scenery; Bareford Mountains, West Milford, New Jersey by Jasper Francis Cropsey; Music by Thomas Wilmer Dewing; and Stuart Davis’s Landscape with Clay Pipe. “Bareford Mountains/New Jersey/J.F. Cropsey. 1850"
Signed lower right: “Elihu Vedder Rome 1875"
Brooklyn Museum Archives. Records of the Department of Public Information. Press releases, 1989 - 1994. 01-06/1994, 035-48.